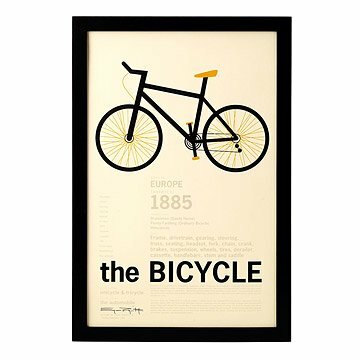 Like an artifact displayed in a museum, this punchy print celebrates the bicycle in all its glory. Inspired by how vintage encyclopedia graphics achieve the maximum visual impact with deceptively simple and minimalist layouts, artist Gene Rogovitz created his stark "info-graphic" series as an homage to these bygone books and well-known objects. Like an artifact displayed in a museum, Rogovitz memorializes this classic ride in his punchy print that is filled with facts about the bicycle's first appearance and the history of the design. With timeless graphic appeal and a slick aesthetic, this new spin on a bike print is a must-have for cycling enthusiasts. Designed and printed on Long Island, New York. For more prints in this series, check out The Skateboard, The Surfboard and The LP. Yes, yes! a thousand times, yes! The size is just perfect; not too big, not too small. It would look great on a wall by itself or mixed in among other art pieces. My dad has been passionate about riding bicycles for most of his life. He loves watching tour de france and other bike races (he's that obsessed). This neat decoration is perfect to hang up in office and add some personality to otherwise bland walls. So happy with this, looks great! Bought without frame because we weren't sure what color frame we'd want, ended up going with simple black frame because we liked the one in the photos on site. Gave it to my boyfriend - an avid bike rider! Bought it as well as the bike bookends from Uncommon Gifts He loves them and wondered where I found such a thoughtful gift. The gift recipient really liked it. While I adore the print, as does my husband, I was very disappointed in the cheapness of the frame. The print actually wobbles! I could have done better at a Big Box do-it-yourself framing station for much less money. The uniqueness of the gift was almost overshadowed by the frame. I'd still recommend the print, just not the framing option. The product itself was good. My only complaint was the glass was dirty and so I had to take it apart and clean it. I was ready to wrap it and so it was pretty inconvenient...Plus, I was worried I was going to get the print wet. Other than that, I was satisfied.